We have social 140 character tweets, social friends following, social photos and now social TV watching. Into_Now has been an app we have had on our iPhone’s for a while. Now, we get a Universal version of the app so we can see more at a time. That means, we see info on what we are watching and friends that are watching too… wonder how they feel about how the show it going, we can ask. Into_Now ‘listens’ to any show your watching, if it’s within the last five years, you will be presented with what the show is and other interesting facts. You can share the show info with your friends through Twitter and Facebook. Into_Now has it’s own social circle too. 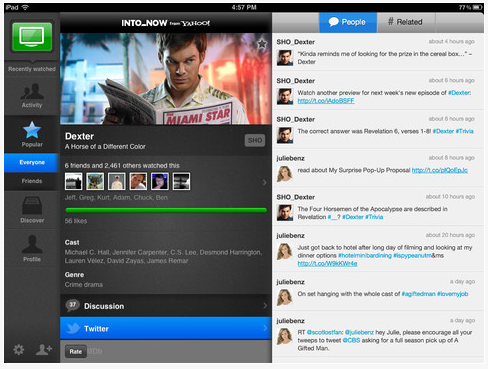 Giving you the ability to find friends within Into_Now that share your viewing choices. Version 2.0 going Universal was only part of the update news. Yahoo has also joined forces with Into_Now to expand the amount of associated information you can get on shows related to what your watching. Identify live TV, or anything that’s run on TV in the last five years, from your television, computer or mobile device. Get full episode and cast information, as well as info on future airings. Receive notifications when your friends are watching the same episode or show. Comment on what your friends are watching in the app, or on Facebook and Twitter. One-click access to IMDb, Netflix, and iTunes so you can learn more or start watching right away.